The M231 Medium Machine Gun is an automatic weapon in service with the United Nations Space Command. The M231 is mounted parallel to the main gun on the M808B Scorpion Main Battle Tank. The M231 provides anti-infantry fire support for the M808B, whereas the standard M808 model uses a pintle-mounted M247T machine gun. The tank's operator controls both the main cannon and the machine gun, which track together on the turret. This eliminates the need for a separate gunner as is the case with the M808C. 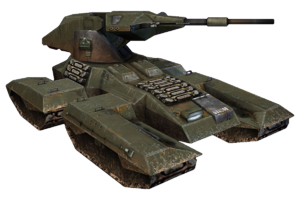 The weapon may be mounted to the right or the left of the Scorpion's M512 smooth-bore high-velocity cannon. A variety of muzzle brakes are available for the weapon, including a long, inline model that fits flush with the barrel and a high profile type reminiscent of the SRS99 sniper rifle series; however, the weapon sometimes lacks a muzzle brake altogether. A seemingly armored heat shroud can also be equipped.